1. Bib and Tucker Small Batch Bourbon Whiskey from 35 Maple Street Spirits out of Sonoma, California. I love this bourbon whiskey and the packaging makes it a perfect gift that doesn’t even need to be wrapped. 2. Lyon Rum from Lyon Distilling Company out of Saint Michaels, Maryland. Jamie and Ben founders of Lyon Rum are not only amazing people but they make amazing rum! This is a must have forany rum lover! 3. Genius Gin out of Austin, Texas produces two amazing gins including the standard strength and navy strength. I love the philosophy of this company and the reasons it was started. They believe – “We love Gin. We believe in making the best product possible with passion guiding each detail. Gin is the only Vodka worth drinking, so we won’t make anything else.” Perfect for sipping or making cocktails. 4. Mad Mint Vodka from Batch 206 distillery out of Seattle, Washington. I love visiting this distillery because all the spirits are so good! Mad Mint goes so well with holiday drinks and is a perfect gift for the home bartender. 5. 3 Howls Blood Orange Vodka from 3 Howls Distillery out of Seattle, Washington. I love using this vodka to spice up my everyday vodka drinks! Recently, I made 3 drinks from this bottle and the cocktails were so good! 6. Corsair Quinoa Whiskey from Corsair Distillery out of Nashville, Tennessee. Yes, you are seeing this correctly this unique whiskey is made from quinoa. How cool is that? This whiskey uses red and white quinoa grains and has an amazing flavor. Mix up a cocktail with this booze and you will not be disappointed. 7. Camp 1805 Backbone Rum out of Hood River, Oregon. I love the boys from this distillery and their philosophy is so awesome! LET NO FLASK GO UNFILLED AND NO LIFE GO TIMIDLY BY! 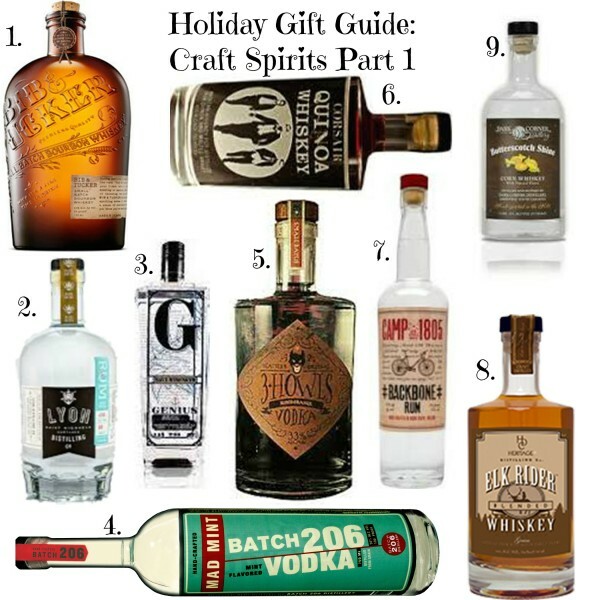 Still looking for the perfect booze gift? This rum is perfect for anyone who loves booze and maybe need to fill their flask! 8. Elk Rider Blended Whiskey is from the wonderful folks at Heritage Distilling Company out of Gig Harbor, Washington. This whiskey is so versatile it is a perfect gift for someone who is a sipper or likes making cocktails. Check this out for the whiskey lover! 9. Butterscotch Shine from Dark Corner Distillery out of Greenville, South Carolina. The moonshine at Dark Corner Distillery is so good! This Butterscotch Shine is perfect for the candy lover or sweet tooth. It is good mixed in a cocktail or sipped on to get the full butterscotch flavor! A perfect holiday treat for any booze lover!